Lock in a great price for Encantada Tulum – rated 9.6 by recent guests! We spent our honeymoon at Encantada and were enchanted. Truly. We were in a building behind the one that was directly on the beach and still saw the ocean, felt the breezes. The staff was amazing!!! This is a very small, boutique hotel. The staff is welcoming and warm. Our room was spacious, clean and cozy! Great breakfast, everything was delicious. Would recommend to everyone. truly above and beyond exceptional service. My Boufrined and I have never splurged on a hotel before and man did we pick the right one! The entire staff was so warm, welcoming, and went out of there way to ensure the most relaxing vacation. Including early check in and late check out. I will definitely be back to encantada then next trip to Tulum! We had an amazing stay! The staff was excellent and made us feel so at home. It felt very private, like we had our own beach. There was on outdoor shower that was perfect after swimming in the ocean and laying out on the provided beach chaises. The cocktails tasted great and it was easy to walk to different restaurants in the area. Beautiful views onto ocean. Excellent, helpful staff. A really nice place for a getaway. The staff was incredibly friendly and the room was always cleaned immediately after we left it. Because it is such a small hotel the staff go out of their way to remember your name and learn about you. I felt at home. I would go back. The breakfast was supreme, the staff was amazing and so friendly, the views were gorgeous and the accommodations naturally beautiful. This was perhaps the best place I've ever stayed, and I travel a lot. Intimate hotel on the beach with a wonderful and large room. Staff were awesome. Encantada Tulum This rating is a reflection of how the property compares to the industry standard when it comes to price, facilities and services available. It's based on a self-evaluation by the property. Use this rating to help choose your stay! One of our top picks in Tulum – and a guest favorite. 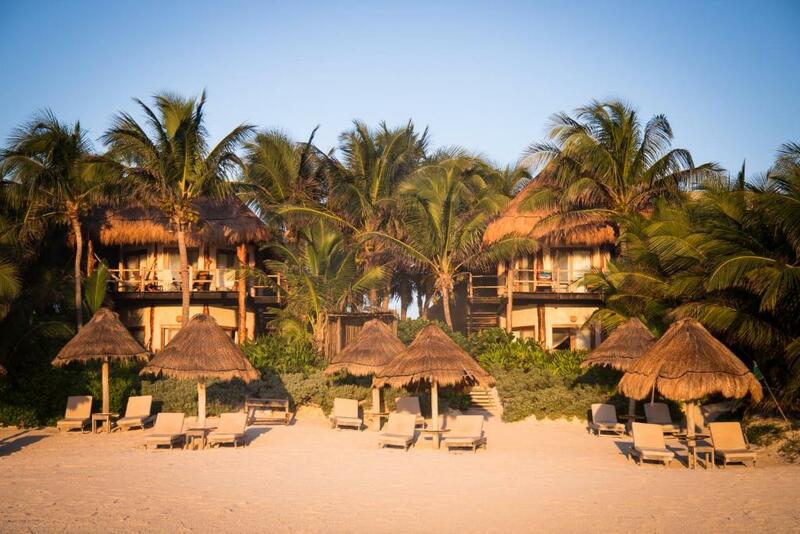 On an unspoiled beach between the Sian Ka’an Biosphere Reserve and Tulum National Park, Hotel Encantada offers tropical gardens, a free Wi-Fi zone and stylish rooms with sea or garden views. Decorated with local textiles and artwork, each charming room has sliding glass doors which open onto a private terrace. All rooms have a ceiling fan, mosquito nets and a private bathroom. A varied continental breakfast is provided, including home-baked bread, fresh fruit, yogurt and granola. Mexican and international dishes are available for lunch, served in the bar or on the beach. 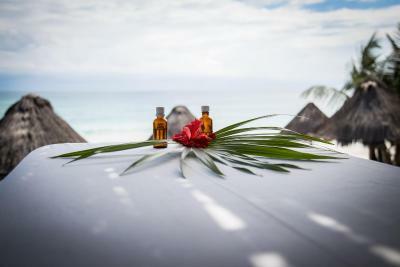 You can book a relaxing massage or hot stone treatment on the beach at Hotel Encantada. The 24-hour front desk also includes a concierge and free bike rental service. Free private parking is available on site, and Cancún is a 90 minute drive away. Airport transportation can be arranged upon request. 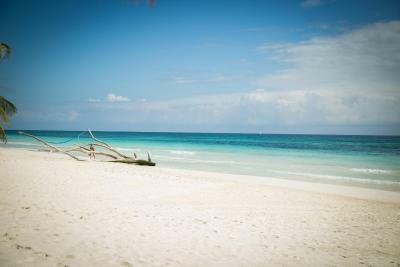 This is our guests' favorite part of Tulum, according to independent reviews. 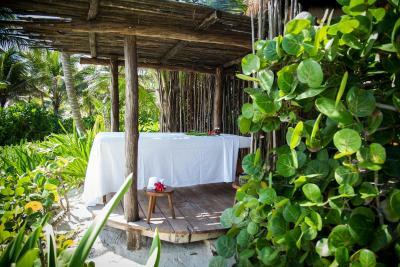 This property also has one of the top-rated locations in Tulum! Guests are happier about it compared to other properties in the area. This property is also rated for the best value in Tulum! Guests are getting more for their money when compared to other properties in this city. When would you like to stay at Encantada Tulum? Decorated with local textiles and artwork, this stylish room has sliding glass doors which open onto a private terrace with sea views. 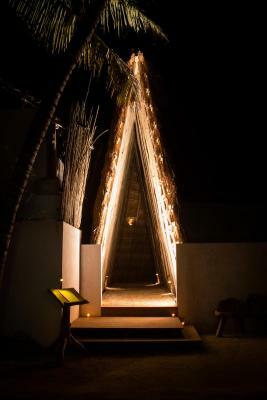 It offers a traditional Mayan-style palapa thatched roof, a king bed and an additional pull-out single bed. All rooms have a ceiling fan, mosquito nets and a private bathroom. Decorated with local textiles and artwork, this stylish room has sliding glass doors which open onto a private terrace with garden views. It offers a king bed and an additional pull-out single bed. All rooms have a ceiling fan, mosquito nets and a private bathroom. This double room features a balcony, sofa and private entrance. This double room features a balcony, dining area and sofa. This double room features a balcony, mini-bar and dining area. This double room has a balcony, private entrance and sofa. 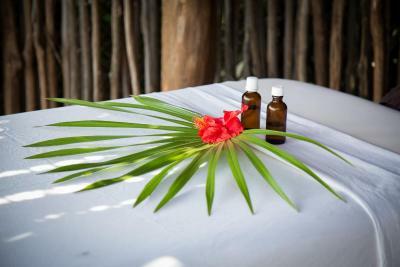 House Rules Encantada Tulum takes special requests – add in the next step! Encantada Tulum accepts these cards and reserves the right to temporarily hold an amount prior to arrival. Children 12 years and older are allowed to stay at the property. Please, contact the property for further details on the additional children fees. Please inform Encantada Tulum of your expected arrival time in advance. You can use the Special Requests box when booking, or contact the property directly using the contact details in your confirmation. There was no actual lounging area, when it rained the hotel itself did not have any place to go except the room. The food options were a little limited. There were no hammocks on the beach or elsewhere on the property. Whole tulum is run with generators so be prepared to hear some noise. Unfortunatly the generator of our hotel was next to our room, my only suggestion to the hotel would be to put a glass window on the room to the side where the generator is. That we didn’t stay longer! Carlos is the most amazing person in the world!!! He made the whole trip. The place is gorgeous and the rooms even better. Just an amazing place! Everything was perfect: Service, atmosphere, facilities, food! The team was great and makes you feel at home - perfect hospitality. We loved everything about this hotel. We recommend it to anyone in the area! Wow! No words can depict the amazing experience! the staff is so amazing and attentive. The room is so comfy and cozy. We loved every bit and piece of that place. WE ARE COMING BACK! Before booking, we did not anticipate extreme noise that we encountered here. The property is squeezed in tight next to many others... Our first two of four nights we experienced a cacophony of noise. Ecstasy-inspired laughter howling into the wee hours. Orgasmic operatic performances at 5 am. The second day, a private party across the street with electronic music thumping from noon til midnight and cute little kids splashing in the pool next door, 10 feet from our window, but they sounded like they were in our room. Power machinery next door. There are 4 small two story bungalows here and the acoustics are a problem in Luna, as the noise reverberates. The staff are exceptionally kind and attentive. The best! Our room was lovely and kept very clean. Food and drinks ordered through hotel were delicious. Beach here is lovely. But While we visited, marred by a seaweed pile up. A bit pricey, but Tulum generally is a pricey area of Mexico to stay in! Beautiful place, very quiet, relaxing, beautiful beach and walking distance to many delicious restaurants. All the staff (Mariana, Ale, Carlos, Julian...) were extremely helpful and nice and we loved our time there!